The sixth full Blogs With Balls took place Wednesday in Chicago, featuring panels on everything from athlete activism to PR to the NBA’s digital engagement, and it provided an opportunity to reflect on how this event has changed over the years and how blogging itself has changed. I wasn’t there for the first Blogs With Balls in New York City in 2009, but I’ve been to every subsequent full one (sadly, I haven’t yet made any of the smaller events they host in between), in Vegas, Chicago, New York, Toronto and now Chicago again. Each event hass had its own personality and its own strengths and weaknesses, but there’s been one theme that’s particularly developed over the years; the conference itself has followed the general track of sports blogging, from something that was mostly done by those outside the traditional media to something with many well-established practitioners who are unquestionably journalists and often pretty close to traditional media. BWB6 showed how far blogging has come, but it also showed how an event like this can still be valuable in this new media world. In fact, it may have provided an excellent blueprint for future BWB events to follow. The evolution of Blogs With Balls has been pretty remarkable, in where the event is physically held and what it’s discussed. First, the physical location. This one was at First Ward Events, which featured a big theatre-style setup, solid lighting and sound, plenty of seating inside for those who wanted to hear the current panel and a bar just outside for those who wanted to talk or eat and drink. It might have been the best locale yet from a functionality standpoint. There’s been generally a steady upward progression there, though; as co-founder and organizer Don Povia noted Wednesday, the first one was held in a New York basement. After that, they went to a generic conference room in the Las Vegas convention center (as part of the bigger Blogworld conference), the bar at Wrigley Field (nice, but relatively small), a Bloomberg conference room (very fancy and businesslike, but buttoned-down by BWB standards) and the Toronto International Film Festival Lightbox theatre (good AV setup and comfortable seating, but no bar, not as fully-contained). This time around, it felt like they found something that was perfect for this event and the mix of people who attend it. The venue progression also shows how Blogs With Balls has become a more independent event over time, one that can more easily stand alone and be held in a bigger facility. The second one, in Vegas in November 2009, was similar, with a panel discussing why bloggers had a hard time getting credentials and mainstream media criticism of bloggers still playing a big role in the discussion (although even then, there was a bit of a sense that many bloggers were getting closer to standard journalism). 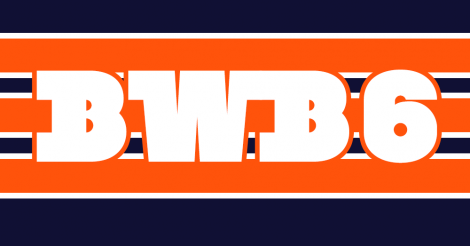 BWB3 in Chicago in June 2010 saw some of those divides between established media figures and bloggers still present, especially when it came to Bleacher Report, but there was a sense that blogging was getting both bigger and more traditional. That was much further reinforced at BWB4 in New York in September 2011, particularly with Josh Elliott’s comments on how ESPN was noticing blogs and the announcement of The Basketball Jones’ deal with The Score. BWB4 also featured a point/counterpoint panel discussion titled “Blogging is dead, co-opted by big media and replaced by microblogging,” and it had more of a focus on brands and PR and how they relate to bloggers than we’d really previously seen. It was BWB5 in Toronto in October 2012 and what came before it that really showed the sea change, though. Kevin-Paul Dupont of The Boston Globe picked that week to call bloggers “replacement journalists,” but the way he was quickly and deservedly shouted down by much of the mainstream media as well as the blogosphere (and really, that distinction was much less significant at that point) illustrated how far blogging had come. The event itself reinforced this; it wasn’t a mainstream/blog divide anymore, with many panels featuring people from both worlds (the hockey one in particular had representatives from CBC, NBC’s Pro Hockey Talk, Yahoo, NHL.com, The Score and Deadspin; if that isn’t a mix, I don’t know what is) and bigger sports blogging networks playing even more of an important role. There was still lots of value there for small, independent bloggers who attended, but a lot of the conversation was about how things work for those who are already well-established. Those trends continued at BWB6. There wasn’t much discussion of a mainstream/blogosphere divide, which really doesn’t exist much at this point (there was a little criticism of a specific blog, Barstool Sports, but that’s a bit different). There was a lot of discussion of advertising and PR, both in ways that made sense for established bloggers as well as those newer to the field. There was also a lot of talk about various journalistic standards and how bloggers apply them, from Spencer Hall discussing SB Nation’s Josh Hamilton post to Christina Kahrl and Cyd Zeigler talking about how to cover trans issues respectively to Keith Bulluck asking the rest of the NFL panel if they consider athletes when writing about their misdeeds to the athlete activism panel pondering things like domestic violence. This conference was smart throughout, and it was also both more focused and perhaps more widely applicable than some of the previous ones had been. The advertising, athlete influence and PR panels seemed more directly relatable to a blogging audience than some at past conferences had been, and the journalistic issues discussed are important for those who run small or big sites. I spoke to a wide variety of people after the conference, and all were quite positive on how it went overall and if it was useful for them. What perhaps stood out here most was that there was no discussion of “what is a blog now?” no real talk about where blogs are going and no comparison of how they relate to the mainstream media. All of those have proven useful fodder for past BWB events and created some terrific discussions along the way, but in 2015, a lot of those discussions feel passé. Most blogs (at least big ones) aren’t really fighting the mainstream media now, and they’re not fighting to gain access either; in fact, the NBA panel had some interesting insights about how teams and the league are reaching out to them, and Ryan Glasspiegel made excellent points on the PR panel about how many bloggers now don’t need or care about access to an athlete if that athlete isn’t going to be interesting. Over the years, Blogs With Balls (with both on-panel discussions and off-panel networking) has played an important role in the rise of the blogosphere to the point it’s at now, talking about its definition, its future and its challenges. BWB6 was much less existential, though, and much more “We’re here; deal with it,” not talking blog identity but choosing to focus on providing intelligent discussions on issues today’s bloggers deal with. That’s an approach that fits with today’s blogosphere, and it’s one that suggests that BWB has a bright potential future even now that blogs are a well-established part of the media. Focusing on what issues bloggers are facing and going to face rather than debates about identity is a smart decision, one that shows Blogs With Balls is moving with the times. In the end, maybe this is even becoming more of a general journalism conference than a specific blogging one; as bloggers move more and more into the mainstream media world, those journalism issues are getting even more important for them. Kevin-Paul Dupont probably still isn’t happy about it, but blogs have won and are here to stay. If it can keep up with the key issues going forward and stay focused on what’s valuable to its audience, the same may be said about Blogs With Balls.